'No Worries' Walk to Everything at Summit Village! This great condo has a wonderful location in the Shanty Creek Summit Village. With its two bedrooms and two baths you have lots of room for your family or friends to join you on an adventure or for a relaxing vacation. The condo has a full kitchen, fireplace, cable, internet, great back deck, stack w/d and has been updated and is super clean. You'll love the ability to walk to the resort amenities (including golf, ski, restaurants, pools, fitness center and spa) and in the summer you can use the private beach club on Lake Bellaire! Golf at Shanty: The courses offer tight fairways, formidable doglegs, breathtaking hazards, and varying elevations, Shanty Creek’s golf courses put golfers in an enviable position—trying to read and play those challenging greens amid the stunning views. Golf theTom Weiskopf designed Cedar River Course, Arnold Palmers Legend, the Schuss Mountain course - a favorite among locals who annually name it one of the top public courses in Michigan and Shanty Creeks original course - the Summit. On and off property: The resorts 4500 acres also provides for outdoor activities, including Indoor/outdoor pools and hot tubs, restaurants and entertainment. swim, boat, use the pools and hot tubs, sightsee - you'll run out of time before you run out of things to do. Please enjoy the resort restaurants and shopping, and visit the great places in Bellaire. There is a movie theatre, video store, grocery store, some cool shops, coffee shops (Moka) and restaurants. In the resort, try Lakeview – it has a fantastic view of Lake Bellaire, Sarduccis, Ivan’s over at Schuss Village or The River Bistro in Cedar River. If you get a chance to go a little further, Dockside on Torch Lake is a fun place to eat with a great setting on the lake. A few more miles will get you to Alden (don’t miss Higgins for the best ice cream around), or Traverse City, Petoskey and Charlevoix. Winter skiing and tubing: Schuss Mountain has long defined skiing in Michigan. So it’s no surprise Shanty Creek was rated 'Best Downhill Terrain in the Midwest' by OnTheSnow's visitors. With four terrain parks and a half pipe, Shanty Creek leads the way for freeriders and twin tip skiing alike. Boasting a variety of ever-changing rails, boxes and tabletops, groomed daily. Jib smaller jumps and rails in the beginner's area, get sick on the features of Purple Daze at Schuss Mountain, catch air at Summit, and grab and twist your way down the pipe. Now with 53 runs on its two mountains and featuring 4 terrain parks, a 300' half pipe, more than 175' of snow, and a 450' vertical drop, Shanty Creek is where terrain meets tradition.Located in Summit Village, SCR's tubing park is fun for kids, families, groups and non-athletes. My husband, children and I enjoyed a lovely weekend. 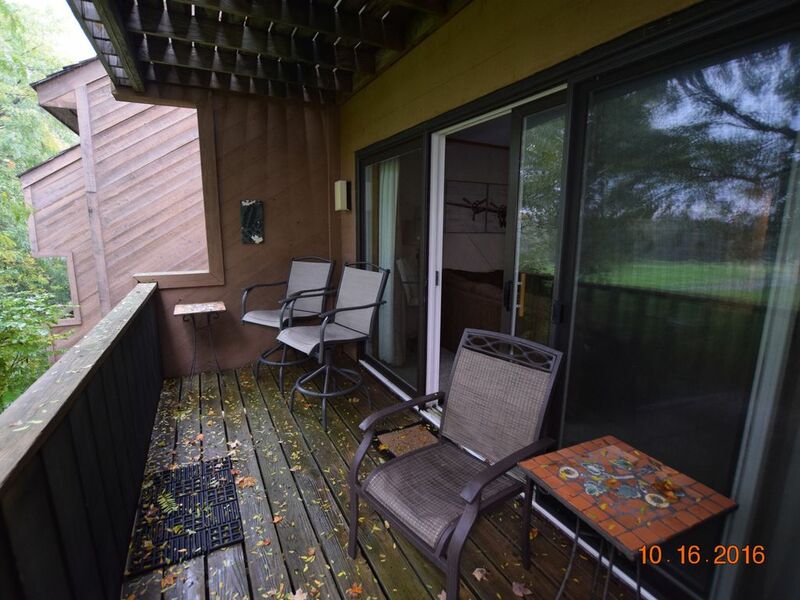 The condo was clean, spacious, located perfect walking distance from the lodge. We would rent the condo again without question! My family has spent many years staying at condos in northern Michigan. This was by far the most comfortable place we have stayed. The living area was larger and more accomodating than any condo we've stayed at in the last 10 years. It is not ski in/ski out, but you are able to walk to Summit Mtn or take the short drive to Schuss Mtn. We will absolutely stay here again. The framed Grateful Dead record made me feel like I was hanging out with good friends. Highly recommended! Great Condo at Shanty Creek! This condo is spacious, nicely decorated, with a great view, and clean as a whistle. I would not hesitate to stay here again. We spent the weekend here and went into Bellaire one night and spent the 2nd afternoon in Charlevoix. Basically we used the condo for sleeping , but it was very well kept and had everything we needed to make breakfast one morning.